Cheated by her stealing, polygamist husband of 17 years, once high-flying corporate exec Christine Meeusen fled penniless with her three young children as her American dream began to unravel. Determined to make a living for her family, she discovered... show all the lucrative business of cannabis farming and met her calling as founder of medicinal-marijuana empire Sisters of the Valley. Shedding her former life, Christine became Sister Kate; on a mission to provide her products to those in need. 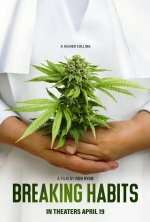 Fighting off the county sheriff, and protecting her crop from deadly black market thieves, Breaking Habits is a story of rebellion, hope and revival.